August 21, 1858, was the day that Abraham Lincoln and Stephen A. Douglas met in Ottawa, Illinois, in the first of the famous Lincoln-Douglas Debates. Ottawa is a town in north-central Illinois. Lincoln and Douglas arrived in Ottawa along with some six thousand spectators, doubling the city population. The audience stood outside in scorching heat for three full hours to hear the debate. 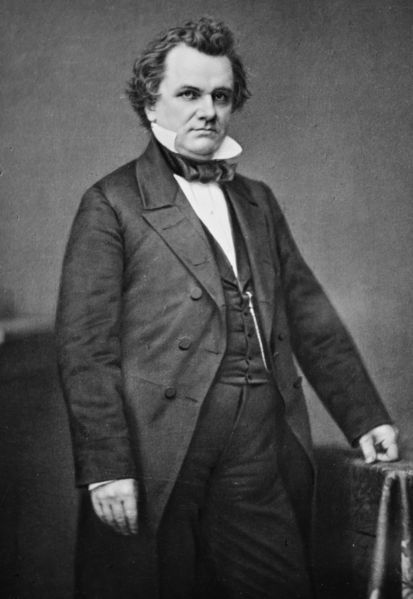 Stephen A. Douglas had been a U.S. senator from Illinois since 1847. He was well known in the nation because of controversial legislation he had introduced�the Kansas-Nebraska Act. This act permitted incoming states to determine whether they wanted to permit or prohibit slavery. 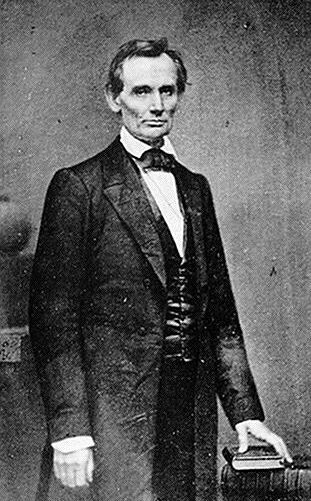 Abraham Lincoln, an Illinois lawyer, disagreed with Douglas's proposal, and this inspired him to challenge Douglas for the Senate seat in 1858. Lincoln opposed extension of slavery in the West. During the senatorial campaign, both men were giving speeches around the state when Lincoln challenged Douglas to a series of debates. Eventually Douglas and Lincoln met that fall in seven long debates. On the day of the first debate they had agreed that Douglas would talk for one hour. Then Lincoln would talk for an hour and a half, and Douglas would finish with a half-hour rebuttal. The debates centered on the issue of slavery and whether African Americans should have the same rights as white people. Even though Douglas was against slavery, he thought that individual states should be able to choose whether to allow slavery or not. His position won Douglas still another term in the Senate, but two years later he lost the presidential race of 1860 to Lincoln. First Debate: Ottawa, Illinois, August 21, 1858 - Abraham Lincoln said, "when the Judge reminds me that I have often said to him that the institution of slavery has existed for eighty years in some States, and yet it does not exist in some others, I agree to the fact, and I account for it by looking at the position in which our fathers originally placed it-restricting it from the new Territories where it had not gone, and legislating to cut off its source by the abrogation of the slave-trade thus putting the seal of legislation against its spread. The public mind did rest in the belief that it was in the course of ultimate extinction. [Cries of "Yes, yes,"] But lately, I think-and in this I charge nothing on the Judge's motives-lately, I think, that he, and those acting with him, have placed that institution on a new basis, which looks to the perpetuity and nationalization of slavery. [Loud cheers.] And while it is placed upon this new basis, I say, and I have said, that I believe we shall not have peace upon the question until the opponents of slavery arrest the further spread of it, and place it where the public mind shall rest in the belief that it is in the course of ultimate extinction; or, on the other hand, that its advocates will push it forward until it shall become alike lawful in all the States, old as well as new, North as well as South." First Debate: Ottawa, Illinois, August 21, 1858 - Stephen Douglas said, "During the session of Congress of 1853-'54, I introduced into the Senate of the United States a bill to organize the Territories of Kansas and Nebraska on that principle which had been adopted in the compromise measures of 1850, approved by the Whig party and the Democratic party in Illinois in 1851, and endorsed by the Whig party and the Democratic party in national convention in 1852. In order that there might be no misunderstanding in relation to the principle involved in the Kansas and Nebraska bill, I put forth the true intent and meaning of the act in these words: "It is the true intent and meaning of this act not to legislate slavery into any State or Territory, or to exclude it therefrom, but to leave the people thereof perfectly free to form and regulate their domestic institutions in their own way, subject only to the federal constitution." First Debate: Ottawa, Illinois, August 21, 1858 - Abraham Lincoln advocated returning to the policy of preventing the expansion of slavery, putting it in "the position in which our fathers originally placed it-restricting it from the new Territories where it had not gone." Lincoln expanded on this point especially in hisCooper Union Address, in which he argued that most of the framers of the Constitution voted to prevent slavery expansion by means of the Ordinance of 1787 and the Missouri Compromise. First Debate: Ottawa, Illinois, August 21, 1858 - Lincoln said, "Then what is necessary for the nationalization of slavery? It is simply the next Dred Scott decision. It is merely for the Supreme Court to decide that no State under the Constitution can exclude it, just as they have already decided that under the Constitution neither Congress nor the Territorial Legislature can do it." First Debate: Ottawa, Illinois, August 21, 1858 - Stephen Douglas read articles from one Republican Party group that opposed slavery expansion and the fugitive slave law and said, "Now, gentlemen, your Black Republicans have cheered every one of those propositions, ("good and cheers") and yet I venture to say that you cannot get Mr. Lincoln to come out and say that he is now in favor of each one of them. (Laughter and applause. "Hit him again.)" First Debate: Ottawa, Illinois, August 21, 1858 - Stephen Douglas said, "Lincoln went to work to abolitionize the Old Whig party all over the State, pretending that he was then as good a Whig as ever; (laughter) and Trumbull went to work in his part of the State preaching Abolitionism in its milder and lighter form, and trying to abolitionize the Democratic party, and bring old Democrats handcuffed and bound hand and foot into the Abolition camp. ("Good," "hurrah for Douglas," and cheers.) In pursuance of the arrangement, the parties met at Springfield in October, 1854, and proclaimed their new platform. Lincoln was to bring into the Abolition camp the old line Whigs, and transfer them over to Giddings, Chase, Fred Douglass, and Parson Lovejoy, who were ready to receive them and christen them in their new faith. (Laughter and cheers.) They laid down on that occasion a platform for their new Republican party, which was to be thus constructed." First Debate: Ottawa, Illinois, August 21, 1858 - Stephen Douglas said the following about Lincoln's House Divided Speech - Lincoln now takes his stand and proclaims his Abolition doctrines. Let me read a part of them. In his speech at Springfield to the Convention, which nominated him for the Senate, he said: "In my opinion it will not cease until a crisis shall have been reached and passed. 'A house divided against itself cannot stand.' I believe this government cannot endure permanently half Slave and half Free. I do not expect the Union to be dissolved-I do not expect the house to fall - but I do expect it will cease to be divided. It will become all one thing, or all the other. Either the opponents of slavery will arrest the further spread of it, and place it where the public mind shall rest in the belief that it is in the course of ultimate extinction: or its advocates will push it forward till it shall became alike lawful in all the States-old as well as new, North as well as South." First Debate: Ottawa, Illinois, August 21, 1858 - Abraham Lincoln said, "Then what is necessary for the nationalization of slavery? It is simply the next Dred Scott decision. It is merely for the Supreme Court to decide that no State under the Constitution can exclude it, just as they have already decided that under the Constitution neither Congress nor the Territorial Legislature can do it. When that is decided and acquiesced in, the whole thing is done."